I was looking at the newest crop of PDAs and smartphones over the weekend. The trend here is towards these flip or slide phones where the screen (usually a touch screen) rotates when you open the phone to reveal a full, (comparatively) large QWERTY keyboard. 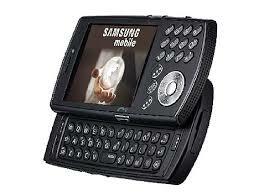 Examples include the AT&T Tilt, Verizon Wireless XV6800 and Samsung SCH-i760. I played around with a couple of these at the happiest place on earth (aka Best Buy) and came to the conclusion that I'm not a fan of this form factor. The concept of a bigger keyboard seems like it would be a good innovation in an abstract sense, but when I atually tried to use it, the weaknesses immediately became clear. First of all, the size of the keys doesn't work for me. If you use, e.g., a Blackberry or Motorola Q (which, for my money, has the best keyboard of any smartphone), you develop the technique of thumb typing using the very tips of your fingers (or even the nails). This works for me, and I can do it with reasonable speed and accuracy. My expectation with the new breed of devices was that you could adopt the technique of typing using the pads of your thumbs, rather than the tips. I could see where this would lead to greater speed and a little more flexibility with being able to hit a key off center and still getting the right character. But it turned out that with my average-sized fingers, the keys were still too small to do this with any degree of accuracy. As a result, I had to switch back to the the tips-of-the-thumbs method, but this doesn't really work either. Because the devices are so wide, I found myself having to shift the way I was holding them in my hands in order to comfortably reach all the keys with my thumbs. This is in contrast with the Blackberry or Q, where I can just cradle the device in my hands and hit all the keys comfortably without having to adjust my grip. Also -- and this is coming from an admitted Microsoft homer -- I feel like we should be able to do better than Windows Mobile 6 on these devices. In the post-iPhone world, I don't think it's too much to ask that these phones offer an attractive, clean, simple UI; a desktop-like browser experience and touch screen functionality that can be easily used without a stylus. I don't really get the cartoonish appearance of the UI on a business-oriented operating system (especially when the UI appearance in recent MS products like Vista is so attractive), and Mobile Internet Explorer isn't in the same sport (let alone the same ballpark) as the iPhone's browser.